What Does Heeling In Plants Mean? In the nursery business we often toss around terminology that some people get confused by. I often suggest to people that when they buy plants late in the fall to just “heel them in” until spring. And they often have no idea what I mean by that. Sometimes we gardeners simply run out of time to properly plant everything in the garden. In the winter, bare root trees and plants or trees and plants in containers do not have the protection to survive the cold and, in the summer, bare root and container plants are susceptible to heat damage. Heeling in plants gives them a little extra layer of protection from the weather.Heeling in plants gives them a little extra layer of protection from the weather. In this video I am going to show you what I mean by that, and show you what extremes I go to in an effort to protect my young bare root plants for the winter. Take a look. Hi Mike, In your healing in plants underground video……you don’t mention anything about water. Do you water them before placing the cover over the underground bed? 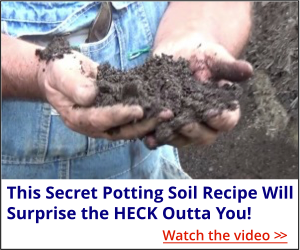 I do, just using a sprinkling can I wet the roots. But honestly, heeling them in above ground works well too. In this video, https://mikesbackyardnursery.com/2011/07/mikes-new-nursery-from-the-beginning/, you’ll see me pulling small trees from an above ground frame I made for heeling things in as well. Usually, people show young plants being “heeled” in close to the ground or on the diagonal. Not sure why. At my son’s college, they got a ton of saplings (deciduous and evergreens) last fall. They didn’t “heel” them in; instead they just put them on the soil and heaped up more soil and then mulch around them. This spring, most got planted and they seem to be thriving! actually, it’s “heeling” in, in reference to using the heel of your boot, to push back and firm the soil around the cutting or seedling. Mike you look just like an old ARK boy like me..I live in Houston now. Mike i am going to get this for Christmas. I have waited 2 yrs but i believe this is my time. Hubby has cancer and i cant work but i adore gardening ..just plants ready to die at 1st..now i root every thing i can get my hands on. I have yucca plants everywhere now im experimenting with japanese plums..loquats..i feel i could be good at this given a chance. Hubby laughs when he sees me ..I take 2.00 and get half dead plants and i succeed. We have a whole group of people just like you. You’d be right at home with us. I love your helpful tips…I’ve often thought about grafting roses, but it’s just that Colorado is so cold in the winter and I don’t have a hot house. Your tips are great though about healing in. I did try to do some cuttings on the Lilac tree that hangs over the fence to my property. I don’t think it worked out too well. I recal I crushed them under foot while trying to regrade the vegetable garden. I think I’ll try that again in the spring and maybe soak them in water for a couple of days first. I do have that root hormone. I’d love to have Japanese Maple varieties grace my front and back yard but I just know this bitter cold weather will kill them. Ohh, the Japanese Tea Garden in Golden Gate Park is beautiful in San Francisco. Love to Bonsai cedars as well. Just wish I was able to have a Japanese maple. Oh and that Bouganvelia, I’d love to have that as well. I even have trouble with the yellow variety of Honeysuckle here. Your yard is gorgeous…which state do you live in?